Gangtey trekking is a moderate trek to the home of black necked cranes in Bhutan who migrate here for winters. This trek of Phobjikha valley at 3000 meters is one of the few glacial valleys in Bhutan. It is chosen home of the rare Black-necked cranes who migrate here in winter from Tibetan plateau. 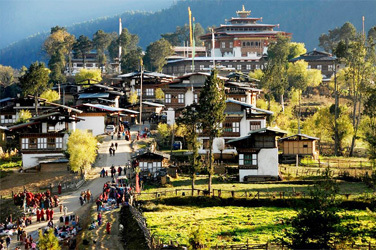 Also the valley of Gangtey is one of the most beautiful places in Bhutan and the Gangtey Gompa monastery is the only Nyingmapa monastery on the western side of the black mountains. The moderate trek visits the village of Gogona and Khotokha, passing through meadows and fields, then forests of juniper, magnolia and rhodendrons. It is one of the finest low level treks in Bhutan. Arrive at Paro Airport (Altitude: 2320meters above sea level): The flight into the Himalayas reveals scenic and breathtaking views of Himalayan Mountains of the world. If weather permits you will be able to see Mt Everest (8848 meters) and other Himalayan mountain ranges. Landing in the Paro valley, surrounded by 4000 meters high mountains stretching across the west of Bhutan, enables you to have a visual landing which is indispensable and that makes your day an unforgettable one. our Bhutanese representative welcome on arrival in Bhutan and drive you through the beautiful valley of Paro to the capital city Thimphu. (2 hours drive). Visit Zorig Chusum Institute 13 traditional arts and crafts. It was established in 1971 by the Royal Government in order to preserve the invaluable heritage and promote the arts of Bhutan, Tashichho Dzong (Fortress of the glorious religion) houses the throne room of His Majesty the King, the main secretariat building and the central monk body, Mini Zoo here you can see Bhutan national animal- the Takin. This is an extremely rare member of the goat family. Sangaygang view point as well as being the location of the transmitter tower of the only national television tower in the country (BBS), the view point is also the perfect place to take in some truly breathtaking views of the entire city of Thimpu. Overnight Thimphu Hotel. Morning visit the weekend market. Market days are absolutely central to the lives of the Bhutanese. Later take a hike to Cheri Monastery hike about 2 hours. Later you can stroll around the city and if you wish you can do some shopping too. Overnight Thimphu Hotel. The valley of Phobjikha is well known as the winter home of the black necked cranes. Bhutan is home to around six hundred black necked cranes with Phobjikha being one of the popular places that the birds migrate to in the winter months from Tibetan plateau. These elegant and shy birds can be observed from early November to end of March. Overlooking the Phobjikha valley is the Gangtey Goenpa. This is an old monastery that dates back to the 17th century. Morning visit Jungshi Paper Factory established in November 1990 as an undertaking of the Royal Government of Bhutan. Later drive to Gangtey valley (4 hours drive). Overnight Gangtey Hotel. A short ascent leads to a pass; then the path descends steeply through a wonderful forest full of birdlife and ever changing vegetation to the bridge in Wangduephodrang. Your car will be waiting there for transfer to the hotel in Punakha: Altitude: 1350 meters above sea level. Punakha served as the capital of Bhutan until 1955. It is the winter seat of the Je Khenpo(Chief Abbot) and the monk body. It has a temperate climate and its rich fertile valley is fed by Pho(male) Chu and Mo(female) Chu (river). (3 hours drive). Later visit Wangdue Town unique to look around with small huts by the side of the road. Overnight Punakha Hotel. Morning visit Kham Sum Yule Lahkahang, it was built by HRH Azhi (Queen) Tshering Pem Wangchuck for a successful rule during the reign of the present Crown Prince Daso Khesar Namgyal Wangchuck, & Punakha Dzong remarkable for its ability to withstand natural disasters - fires and earthquakes have done nothing to diminish its grandeur the Punakha Dzong is rightly famous throughout Bhutan, as well as being one of the most well protected buildings in the country. Later drive back to Paro (4 hours 30 minutes drive). Overnight Paro Hotel.